Each tablet contains: Sodium Diclofenac 50 mg, Pridinol Mesylate 4 mg.
Excipients: lactose monohydrate, microcrystatlline cellulose, sodium croscarmellose, magnesium stearate, colloidal silicon dioxide, hydroxypropylmethylcellulose E15, yellow iron oxide, red iron oxide, titanium bioxide; polyethylenglycol 6000; talc. Therapeutical action: analgesic, anti-inflammatory; muscle relaxant. 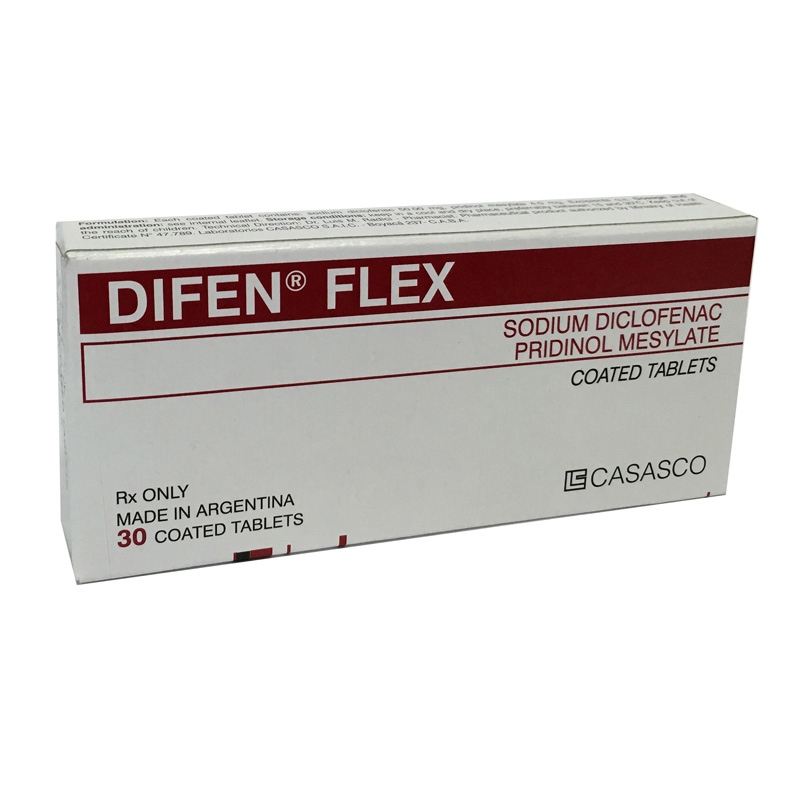 Diclofenac is well absorbed from the gastrointestinal tract, however, due to the metabolic first pass effect, only the 50% of the absorbed dose is systemically available. The peak plasma levels are reached at 2 hrs with a range of 1-4 hrs. the AUC is proportional the dose in the 25-150mg range. The peak plasma level for a 50 mg-dose is 1,5 µg/ml approximately. After the repeated oral administration of the product in 2 daily doses Diclofenac is not accumulated in plasma. When it is administered together with meals, the absorption is delayed in 1-4.5 hrs and the peak plasma levels are reduced by 40%. However, Diclofenac absorption degree is not significantly affected. It is reversibly bound to the plasma albumin in a percentage superior to 99%. As with other NSAID, Diclofenac diffuse in the articular space when the plasma levels are higher than the levels in the synovial liquid. Diclofenac is eliminated by urinary excretion (65%) and biliary excretion (35%) as conjugated metabolites (glucuronide and sulphate). The plasma half-life is 1-2 hrs. Diclofenac is also detected in human milk. Pridinol is absorbed in the gastrointestinal tract reaching the peak plasma concentration 1 hr after its administration, 30-40% of the dose is concentrated in bile and in other tissues, especially liver and kidney. The urinary elimination is produced as non-conjugated drug in 9% and a similar percent as its glucuronide conjugate. One tablet twice a day, preferably after meals. It may be adjusted according to physician’s criterion. Treatment: In case of an overdosage, it is recommended the immediate gastric emptying by lavage or vomit induction. Forced diuresis may be beneficial since drugs are excreted in urine. Dialysis or hemoperfusion efficacy has not been stated in the product elimination. The use of activated charcoal may help to reduce the drug absorption.